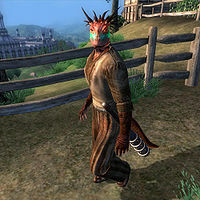 Sakeepa is an Argonian herder living in Aleswell. He owns a dog, simply named Sakeepa's Dog, that follows him everywhere he goes. Like his neighbors in town, both Sakeepa and his dog have been made invisible, courtesy of Ancotar's experiments in Fort Caractacus. Visible or not, he gets out of bed every morning at 6am and heads to the corral outside his house to collect his flock of sheep. He then leads them west onto the Red Ring Road and strolls around the grassy area near town for the next eleven hours. At 5pm, he heads back to Aleswell and locks up the sheep for the night, followed by a three-hour visit to the local inn at 6pm. He leaves at 9pm and returns to his house for a bit of wandering before his bedtime at midnight. He carries around quite a miscellany of items: a pitchfork, shears, a wolf pelt, and a roll of yarn, as well as a small amount of gold. He is armed with a club and his wardrobe consists of typical lower class attire: a coarse linen shirt, a pair of coarse linens, and oiled linen shoes. If you approach him before the related quest is completed, he won't engage in conversation, but only point you towards Diram Serethi: "We've all agreed to let Diram be our spokesman. You'll find him in the inn, if you look very carefully." Upon successful completion of the quest, it's another matter, and he will greet you with the words: "Hello friend. Stay a while and watch the sheep with me!" or even "We'll never forget how you saved us from Ancotar's crazy magic. What can I do for you?" He also shows good grace towards Ancotar: "I say live and let live. It was an unfortunate accident, and he helped make it right. Others in the village are not so forgiving, though. I don't blame him for keeping to himself." However, should you fail the quest, he is not nearly as gracious: "I'm not normally a bitter person, but you are not welcome here." Even though it looks like the whole herd of sheep are supposed to follow him onto the Red Ring Road, it's usually only the horned sheep that will follow him around—the others will stay in town.